(CNN) -- Manchester United goalkeeper Edwin van der Sar returns to Rome's Stadio Olimpico on Wednesday confident he can avoid a repeat of his 1996 Champions League final anguish with Dutch club Ajax at the same Italian venue. Van der Sar is determined to avoid a second Champions League final defeat in Rome's Stadio Olimpico. Holders United face Barcelona in a match that has gripped the world of football with veteran Van der Sar standing between the likes of Lionel Messi, Samuel Eto'o -- and a Catalan celebration. Thirteen years ago holders Ajax lost their Champions title to Turin-based Juventus on penalties after extra-time in Rome. But the 38-year-old van der Sar believes United's spot-kick shootout triumph in Moscow a year ago against Chelsea can help tip the balance his way this time. "As a goalkeeper you always expect every team to give you nightmares," said Van der Sar who was also in the Ajax side that lifted the title 1-0 against Inter Milan in 1995 in Vienna. "Every flaw you have or lapse of concentration can cost you a goal so you have to be on your toes every minute of the game. "You work hard the whole year to come to certain parts of the season when you can get your hands on some silverware: we did it with the league title and we want to do it now. "We have experience. We went last year and we know how big the game is. Let's hope we can have some advantage with that." Who is the world's best footballer? 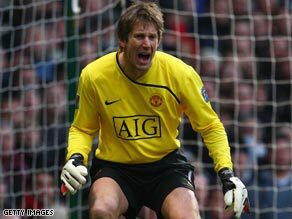 Van der Sar is the Netherlands' most-capped player, having been involved in a World Cup and two European championships. Therefore, the prospect of facing Messi, Eto'o, Xavi and possibly Andres Iniesta and Thierry Henry should hold no additional worries for the Dutchman. "Maybe I'm less nervous but there is 13 years in between," he told PA Sport as he reflected on his previous Champions League final in Rome. "There has been a lot of activity and games in between so you know certain situations a little better than at that time." Van der Sar has one year left on his United contract and is determined to seize every opportunity before he has to eventually hang up his gloves. "It is coming closer and closer," he accepted.